For New Year's, my brother gave me the gift of the a.o.c. cookbook; a book I had been coveting. A.O.C. is one of L.A.'s exceptional restaurants, and the book is equally impressive. I had 30+ people over for dinner on Friday night (more on that in a forthcoming post), and I wanted to make a great dessert. As I skimmed through the book, I came across its recipe for Roasted Pear Crisp with Cranberries. I love making crumbles and crisps for parties. You can do most of the work ahead of time, pop it in the oven while people are eating the main course, and your entire home becomes filled with the smell of butter, spiced fruit, and the promise of something delicious for the end of the meal. Most crisps are super simple to make. This recipe includes an extra revelatory step: you brown the fruit in butter and sugar before you put it in the oven with the topping. This extra step means extra work, but the extra work leads to extraordinary flavor. I'm not going to lie: this dessert is time consuming. However, you and your guests will be handsomely rewarded for your efforts. My methodology for making crisp will never be the same. You can make the compote several days before you assemble the dish. Combine the cranberries, sugar, spices, vanilla, water and juice in a sauce pan. Bring to a boil over high heat. Reduce the heat and simmer the compote, stirring occasionally, until the cranberries are tender and the compote has thickened, about 10-15 minutes. Cool to room temperature. Remove and discard the cinnamon and star anise. Transfer to the fridge to cool. It will thicken a bit more in the fridge. Prep all of your ingredients. Peel, core, and slice the fruit. I like to core apples and pears with a melon baller. I slice the pear wedges just slightly larger than the apples, because they are less firm and soften quicker when baked. I like the combo of the apples and pears; the tartness from the apples balances out the sweetness of the pears. If you are just using pears, use 12 pears total as the recipe originally suggested. If you are just using apples, you will probably need 8 total, depending on their size. Combine the flour, 1/2 cup plus 2 tablespoons granulated sugar, 1/4 cup dark-brown sugar, salt, cinnamon, and nutmeg in the bowl of a food processor fitted with a metal blade. Pulse a few times, just to combine the ingredients. Add 12 tablespoons of butter, and pulse just until the butter and dry ingredients come together and resemble a coarse meal. You can also make this mixture by hand using a pastry cutter. Turn the meal out into a bowl and use your fingers to squeeze it into clumps. Transfer the topping to an airtight container, and refrigerate it until you are ready to use. 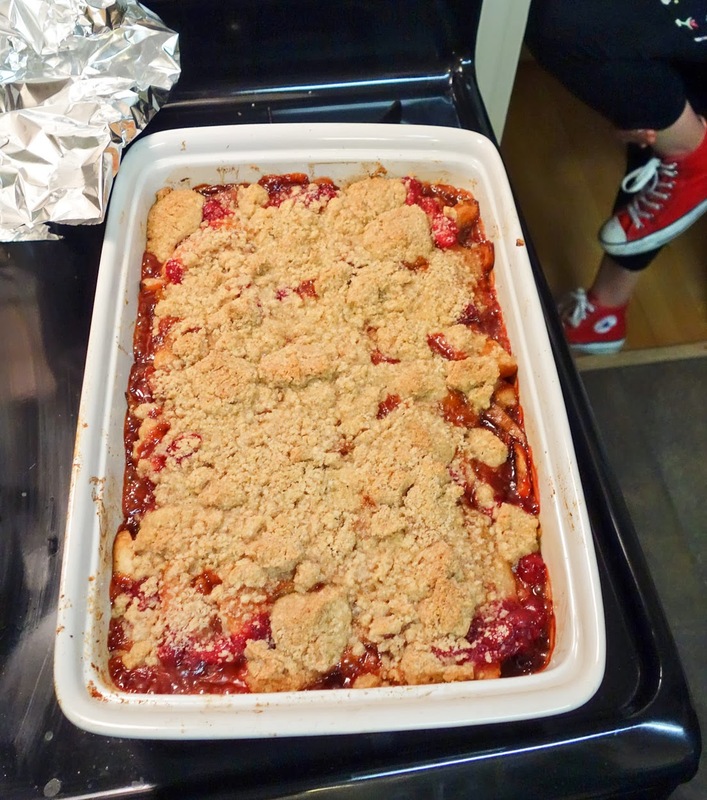 I made the fruit part hours before the party, and I kept the topping separate until I was ready to stick the dish in the oven. Heat a cast-iron skillet over high heat for 1 minute. Add 1 tablespoon butter, and sprinkle 1 teaspoon of the granulated sugar evenly over the bottom of the skillet. Add the pears cut-side down in a single layer. You will need to cook the pears in batches, don't crowd the pan or the fruit won't brown properly. *Note, I forgot to peel the pears at first, and then I had to go back and remove them. This was dumb. Cook the pears for about 4 minutes without moving them, until the undersides are golden brown. Use tongs or a spoon to turn the pears to caramelize the other cut sides in the same way; turn each pear as it is done, some will brown faster than others; be careful not to burn them or let them get mushy. The second side will brown much faster-about 2 minutes. Remove the pears from the skillet to a sheet pan in a single layer, and let cool to room temperature. Wipe out the pan with paper towels between batches. Continue this process until all of the fruit is browned. Rub a little butter on the inside surfaces of an 8 x 10, or 9 x 10 baking dish. Sprinkle the remaining 2 tablespoons of brown sugar over the butter. Arrange half of the browned fruit in the dish, and spoon half of the cranberry compote over them. Top with the remaining fruit, and then top with the remaining compote. Sprinkle the top of the crisp with the butter and flour topping. Place the dish on a baking sheet to catch any juices that bubble over, and bake for 30-40 minutes, until the crisp topping is golden brown and the fruit is bubbling up around the edges. Remove the crisp from the oven, and let it cool slightly before serving. Serve with vanilla ice cream, whipped cream, or yogurt sherbet. Observe the looks of satisfaction as people bite into this warm, heavenly dessert. Enjoy.